Can you confirm these amateur observations of Phalotris bilineatus? spegazzinii: S Brazil, Uruguay, Argentina (Mendoza, San Juan, San Luis, La Pampa); Type locality: La Plata. Comment Synonymy: partly after PETERS & OREJAS-MIRANDA 1970 and CEI 1993. Elapomorphus spegazzinii and other species have been considered subspecies or synonyms of Phalotris (Elapomorphus) bilineatus (see e.g. PETERS & OREJAS-MIRANDA 1970). De LEMA (1979) synonymizes Elapomorphus bilineatus with E. lemniscatus. CARREIRA et al. (2005) also list Phalotris bilineatus as synonym of Phalotris lemniscatus. Elapomorphus reticulatus PETERS 1860: 518 has been removed from the synonymy of E. bilineatus (by FERRAREZZI 1993). “Phalotris bilineatus" is a name based on a hybrid specimen between Phalotris suspectus x Phalotris spegazzinii (de Lema, 1984). GIRAUDO & SCROCCHI 2002 and more recently WALLACH et al. 2014: 535 list this species (incl. suspectus) as synonym of Ph. bilineatus. LEMA 2002 considered them as valid. 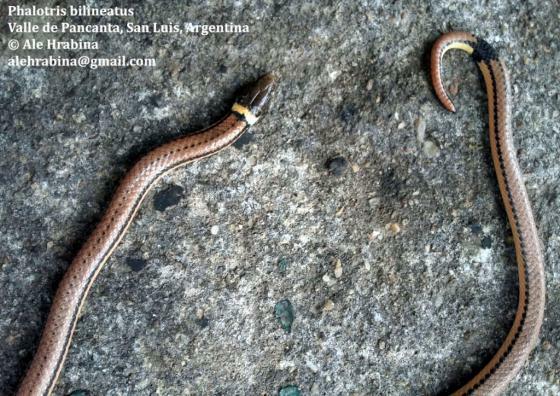 COSTA & BERNILS 2015 consider bilineatus as a synonym of P. lemniscats (following Lema 1979). Distribution: Not in Paraguay (fide Paul Smith, pers. comm., 27 Apr 2014). Scrocchi, G.J. ; Moreta, J.C. & Kretzschmar, S. 2006. 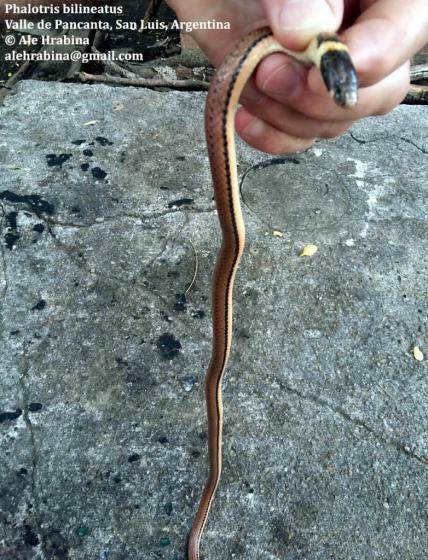 Serpientes del Noroeste Argento [Jujuy, Salta, Tucumán, Catamarca, La Rioja, Santiago del Estero]. Fundación Miguel Lillo, Tucumán, 178 pp.